This Snowman is ready to measure the snow fall as soon as it starts accumulating! His smiling face, rosy cheeks, and fabric scarf will brighten your day every time you walk past him! The kiddos will love checking to see how much snow has fallen! Add some rustic country charm to your home this holiday season with this handmade wooden, primitive measuring snowman with stakes. Let it snow! 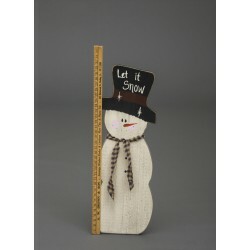 As you watch the snowflakes falling, this whimsical outdoor decoration displays the amount of snowfall each day on a yard stick. Crafted by Pennsylvania Amish. Delightful, rustic measuring snowman decoration. Stakes included.